From My Front Porch To Yours: Saving Money at Target & A $1,000 Target GiftCard Giveaway! 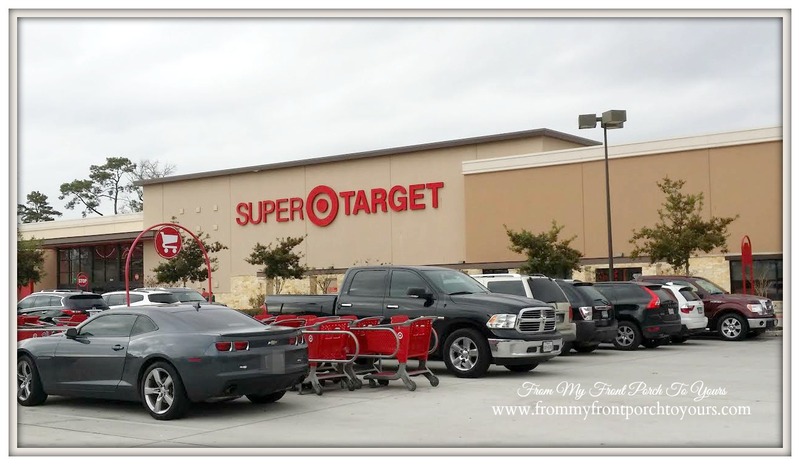 Saving Money at Target & A $1,000 Target GiftCard Giveaway! I love Target! I have been shopping at Target since the mid 90's. They have wonderful home decor, clothing and now that I am married, have kiddos, and have a household to run, I do my grocery shopping there. Because of that a few months back we signed up for The Red Card. We figured, heck why not save 5% every time we shop there? We were basically throwing money away by not signing up. As if 5% off was not good enough I was recently told about the new Target Cartwheel App! You can use the new Cartwheel App from your phone, laptop or desktop computer. It is fairly easy to use once you figure it out. Here is how I use it. 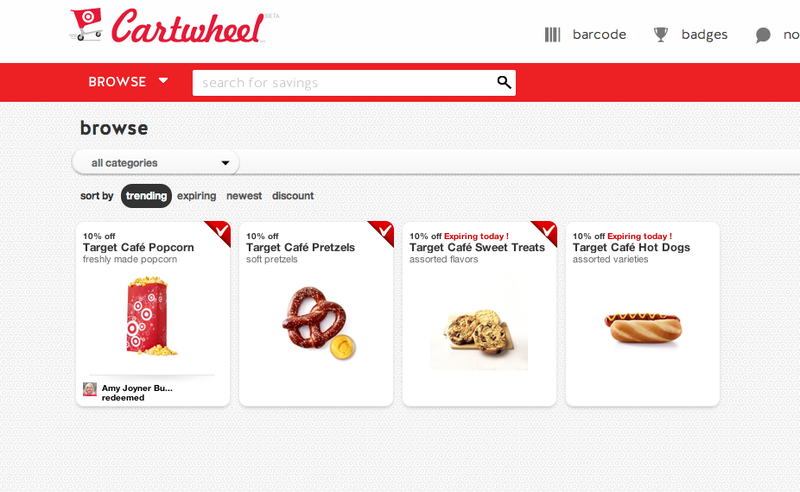 First I sign into the Cartwheel App from my desktop to browse all the offers. They have so many categories with over 700 offers (coupons) to choose from. After you choose the category you want to browse you just click on the offer you want to add to your Cartwheel. There are even offers for Target Cafe! This is a plus for Oldest & Littliest because every Friday after school you can find us browsing the Target aisles with snack in tow. 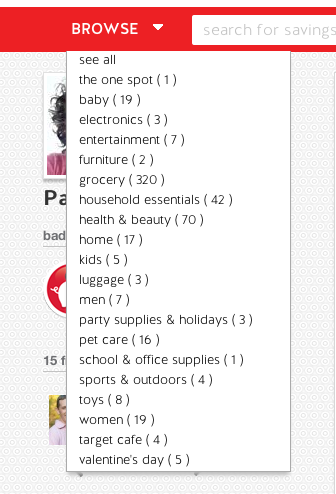 A drawback to the Cartwheel app is that you can only add 17 offers/coupons to your Cartwheel. This means you should choose wisely. I am hoping that in the future they will change that. The app keeps up with your offers/coupons and also how much you have saved...or at least it is supposed to keep up with how much you save. I will get back to that in a moment. After I loaded all the offers/coupons I wanted onto my Cartwheel I headed off to Target with phone in hand. My first offer/coupon I took advantage of was, of course, at the Target Cafe. 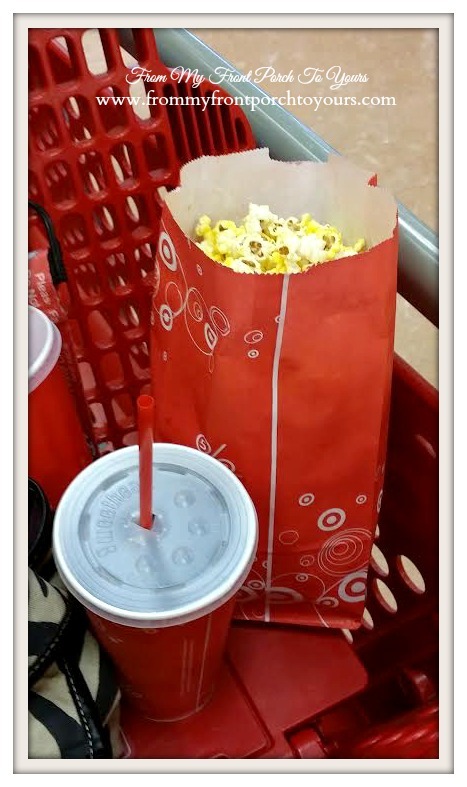 What trip to Target is not complete without a popcorn Combo!? All I did was show the girl at the checkout my bar code. She scanned it and I saved. Easey Peasey. 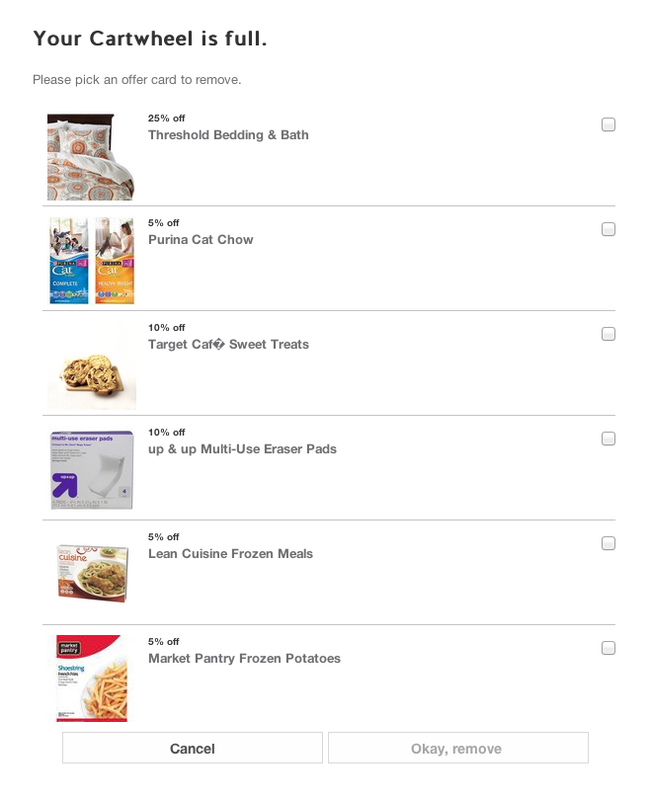 These are the items I saved on with the Cartwheel App during my last visit to Target. Here is where the savings come into play and my adrenaline starts rushing! ;) T-shirt for Oldest normally $12.99 with Cartwheel App just $10.39. Boys socks normally 6.99 with Cartwheel App just $5.24. The biggie and most impressive savings was on the king size sheets I purchased. They were normally $59.99 and I paid only $44.99 with the Cartwheel App! I wanted to see just how much I actually saved using The Cartwheel App so I came home and added it all up. Without The Cartwheel App my total was $109.19 BEFORE tax. By using The Cartwheel App my total BEFORE tax was just $85.35. That is a savings of $23.84 BEFORE tax and BEFORE my additional 5% I saved using my Target Red Card. Yes you heard that right you still get the additional 5% off when you use your Target Red Card on top of your Cartwheel savings. A win win in my book! There are a few drawbacks to the App in my opinion. One drawback which I mentioned earlier is that you are only allowed to add 17 offers/coupons to your Cartwheel. The second and I am sure it is just a kink and honestly has no effect on my true savings is the fact that it did not calculate my savings accordingly. The App says I only saved $.41 when I clearly saved $23.84 before tax. The app is for in store only purchases which is not a big deal. Pluses are that you can use Cartwheel offers over and over until they expire. They do have a daily limit though of 6 Cartwheel barcode scans, meaning you can receive the discount on everything on your Cartwheel list up to 6 times every day. 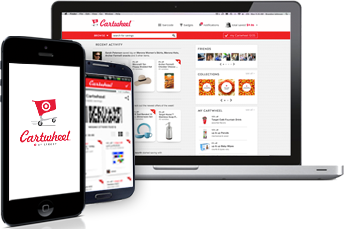 Cartwheel offers are typically weekly, monthly and quarterly. In my book Target's Cartwheel App gets two thumbs up! Now on to the Sweepstakes! You can win a $1,000 Target GiftCard® by leaving a comment telling me what your favorite Cartwheel offer is. Leave a comment on my blog letting me know you would like to win the $1,000 Target GiftCard and if you already use the Target Cartwheel App to save money. Hi, Pamela! I use the Cartwheel app. We recently used the 40% off card tables and chairs for their cute aqua chairs for my daughter! Great deal! Thanks for a chance to win. I have never used the Cartwheel app but my niece does so when I just checked it out, her account showed up too. I will have to really take the time to check it out so I don't have a favorite yet but I will. Thanks for sharing the app and entering me for a chance to win. What an awesome giveaway! Can't wait to check out that new app! I love the Target Cartwheel. I use it all the time. The thing I love is when you get savings on top of already sale priced items and then another 5% on top of that with the Target Card. It is awesome sometimes on one item you can save over 60% off. Thanks for the chance at the win for the Target Gift Card. Love Target!! Wooo Hooo! Would love to win. Hi Pamela, I adore the Target Cartwheel app and love the promotions they run. Today they had 40% off Valentines for one day only so I had an excuse to hope on over and grab a deal for my 3 boys! I love how you can search by brand too so if you are standing in line and have some items in your cart you weren't sure about...search and boom...another wonderful discount to be had! I find myself at Target more and buying more just for the savings! I LoVe Target cartwheel! I have taken advantage of the 40% off Giada cookware. I am sooo excited! Love this app! Thank you for the turn on! I shop weekly at target . I also have college aged childeren I send things too. Easy Peasy. Love the weekly ad at my fingers in the store. 40% off Giada line! I'm needing a stainless steel pan and downloaded the app a few days ago! I already use the Cartwheel app and love it! Thanks for the heads up about the new app. I think sheets and towels to go with my recently updated master bedroom and bath would be great. I would totally love to win this usisng the app. I have the app and it is awesome! Thanks so much...I could really use some 1000 dollars! I will download the app as soon as the phone charges...#storyofmylife I am in desperate need of winning! I am a Target addict!!! I would love to win $1000 to my favorite store! I would probably spend it in one day ;) I use the Cartwheel App, Red Card, and coupons and save a ton. There are so many great offers so I don't know how I could choose my favorite, so I will tell you my favorite from my current Cartwheel is 20% off Gevalia K-Cups! Thanks for the giveaway! I would love to win! I've got a Target 3 mins from my house :) Kids need new clothes. I've never tried the app, I have no smartphone. I could really use this card! My favorite cartwheel offer right now is the 20% off items in the one spot. I like the home decor offers. I would like to win the $1,000 Target GiftCard. I do not use the Target Cartwheel App to save money at this time. I love Target and would be thrilled to win the $1,000 gift card! I haven't heard of the Cartwheel app but it sounds great. I'll definitely have to try it. I love target too and use their cartwheel app all the time! My favorite Carthwheel offers are the ones on apparel. Target is a great place to shop and to save money. I love using Cartwheel! Right now, the 20% off The One Spot is a great offer! I would like to win the $1,000 Target GiftCard. I've already use the Target Cartwheel App to save money. Th e Cartwheel always has offers on top of the great deals at Target! 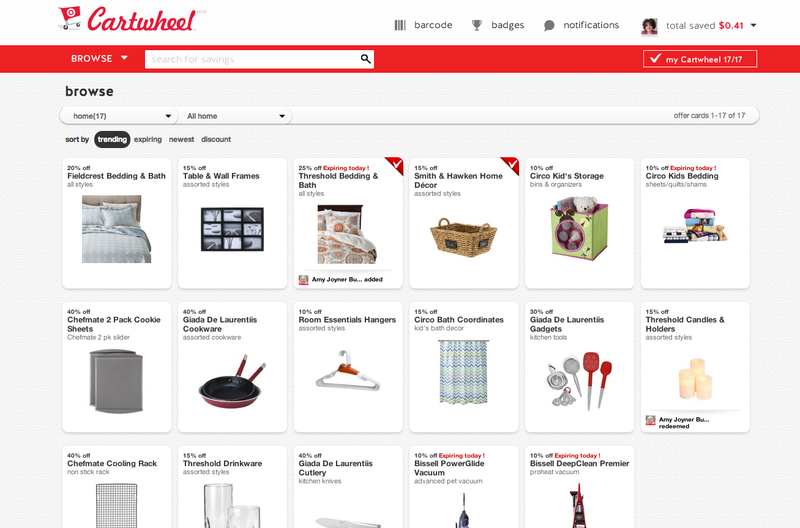 If you love Target you have to love Cartwheel! Wow... what a great giveaway... thanks for the chance. I love the cartwheel deal on Mossimo outerwear...can never have enough Mossimo... cute clothes at afforadable prices and now with Cartwheel I can save 15%... yea!! Can't wait to check out the other Cartwheel deals! I haven't used the app yet, but I will. I have downloaded the app, but I live about 45 minutes from the closest Target, so I haven't had a chance to use it yet. But I would LOVE to win, and take advantage of the toddler clothing on sale so I can get my twins ready for spring! I love the cartwheel app. My favorite coupon was the Gia G. coupon that I used to buy small spatulas. Such a good purchase! I would buy new bedding. I shop at Target multiple times a week and always use Cartwheel! It would be incredible to win. I am going to get the Cartwheel app right now! Would love to win the $1,000 to shop there! This is the first time I've heard of the Cartwheel app! Will definitely have to get it. I LOVE Target!!! I like the diapers offer. Awesome giveaway! I do use Cartwheel already - have only used it once, but it's really cool. I love cartwheel - I'm trying to really watch my money closely so that my fiance and I can have a great wedding without going into debt. 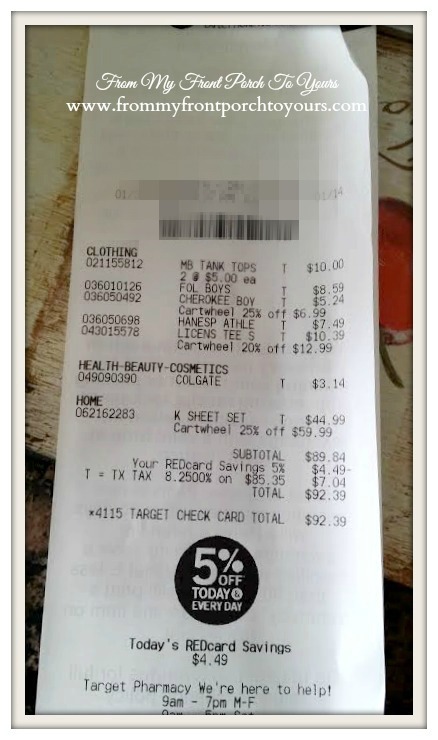 target helps me do that not only by offering me everything I need in one shop, but also by accepting manufacturer's coupons, offering target-specific coupons, AND by using Cartwheel to really stack up the savings. and unlike other "sales", Cartwheel ALWAYS offer discounts on stuff I really use (I can almost always find deals on pet supplies, personal care, snacks and even clothing items for everyone!). 10% of nature valley bars is pretty sweet. I have looked at cartwheel before, but was just overwhelmed by it and seemed to only see deals my friends were getting and a few others.. I love the food coupons. I have had Cartwheel about 3 months and love it. I use it almost every week as my job is almost next door and I go their after work if I need to pick up anything before going home. I don't think it's possible to love Target and NOT have the cartwheel app. And I love all the offers. I love the 40% off Giada! That is a great deal! I'd love to win a Target gift card of course, i've never used the cartwheel app until just now. I'd have to say my favorite coupon on it would be the 25% off Playskool Heroes Hulk Toys because my son loves the Hulk and his birthday is coming up! I don't have an account yet because I'm just hearing about it. I will get it before heading back to Target. thank you! I've never used the app, but I will check it out now for sure!! We just moved across country and sold everything we owed. If it didn't fit in car it wasn't coming with us. So now we have to purchase absolutely EVERYTHING! My Target App cart is only 2/3 full and it's already $2,200. Yikes! I want to win, but have not used the app. I would love to win, Target is my favorite store! I use the cartwheel app all the time and love it! I use it to save on groceries, baby food/diapers and household necessities. It really makes a difference to have that little bit of extra savings! Oh....I would LOVE to win! Cartwheel is awesome and I've been using it ever since in came out. I'm loving the current offer for 5% off Market Pantry baking goods....I want to bake all the things for Valentine's Day! I would be thrilled to win. I haven't used the app before but am downloading it now. I love shopping Target. I like the 5% off Toaster Strudel deal. I would love to win. I have not used this app but I will be downloading it. Seems like everyone loves it. I can't wait to try this app! i use cartwheel ALL the time while shopping at target! i save so much money! I like the 15% on frames -- used it today! I would use it on lots of grocery items - cheezits for 20% off for sure! OMG Thank you - I had not heard about this and what a way to knock a little more off that bill! I mean really who can walk into Target for 1 thing and not leave with a $50.00 tab and 1 sack with 10 things by the time you get out! I love Target and they are my go to for everything - I have explored and I will definitely be using this app ALOT! I would love to sit and find my favorite item right now, but I have to work... I had a 3 min breather between tasks and its back to the salt mind. Will look for great savings soon! Now back to earning that paycheck so spend at Target! Great giveaway. Sadly I don;t have any special kind of phone that can do this sort of stuff, but one day I will and I'll be straight over to Target! I love using Cartwheel! Since signing up a couple months ago, I've already saved over $50!!! I like the offers on home decor. Hi, Pamela! I have the Cartwheel app on my phone but haven't used it much. You've inspired me to though. :) Thanks for doing the giveaway! I have not downloaded it yet but plan to! I don't use the app because I have a dumb phone instead of a smart phone. If I had a smart phone which I would buy if I were able to win the $1000 gift card, then I would gladly use the app. Thanks for the chance. I love the Target cartwheel! I don't have a smart phone, but I just do it on my computer before I head to the store! I've saved some BIG bucks with it and additional coupon savings. I would LOVE to win some $$$ to Target. Winning this gift card would help my family get ready for summer. I have used the Cartwheel before and my experience has been positive. I love the app! I just started using it befor the holiday's and saved a lot. My favorite deal was 20% off bedding. Which came in handy. I love the 10% off Up & Up Storewide! The ones that are the best are clothes! I would love to win. I haven't used the app yet. My favorite offer is 5% off Market Pantry chocolate chips. I love baking with chocolate chips! My favorite offers are all the grocery deals! 20% off Kraft Mayo! I have just started using the app, my daughter showed me how! I love all the different areas you can save and being a mom to 5 and a grandmother to 6 all areas will help me, but I love the grocery and kids the best! 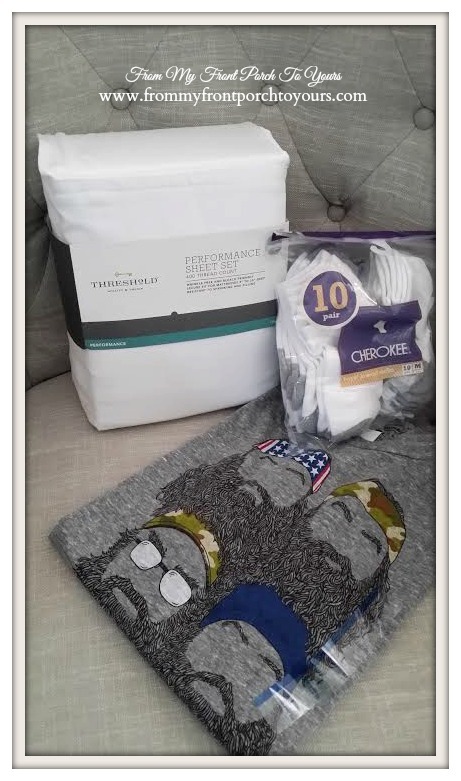 Thank You for the chance to win a gift card to one of my favorite stores! I don't have a smart phone or tablet to use Cartwheel on so I haven't tried it. I like the sales at Target. I would love to win $1000 to spend at Target. 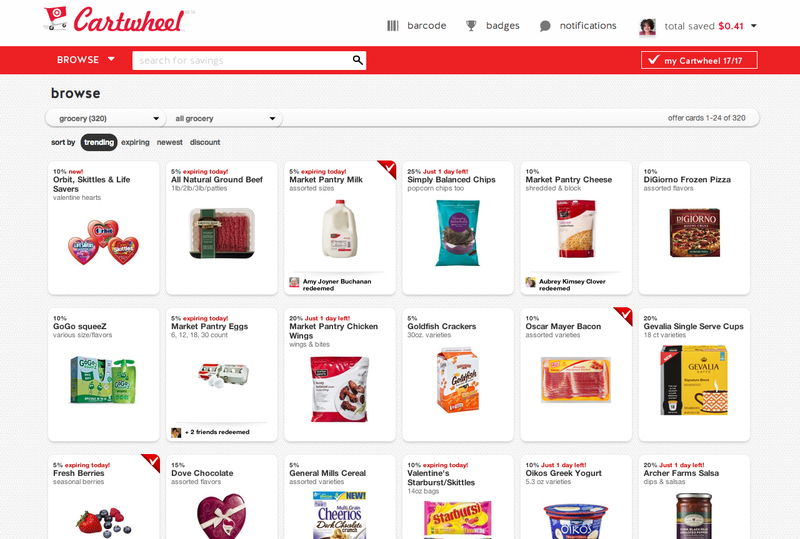 I use Cartwheel every time I shop at Target! The only negative is that I don't have a smartphone, so if I forget my printout with the barcode, I can't access my deals. My favorite Cartwheel offers are the food ones! I'd love to win, I have been using the Cartwheel app for awhile now. I would love to win. I had never heard about the Cartwheel app so I am off to find it and download it. Thanks. I like the offers on food, especially dairy products. I just got a new phone and I'm excited about downloading this app. I love Target shopping and this will just be icing on the cake. I am also expecting a new grand baby in October, so I will be taking advantage of the baby related deals. I wish I had a smartphone so I could use the app - looks like great deals! Being able to use an offer over and over until it expires...Cartwheel doesn't have a limit.